A detention deputy at the Pinellas County Jail was fired Thursday for using excessive force on an inmate in a wheelchair, according to a press release. 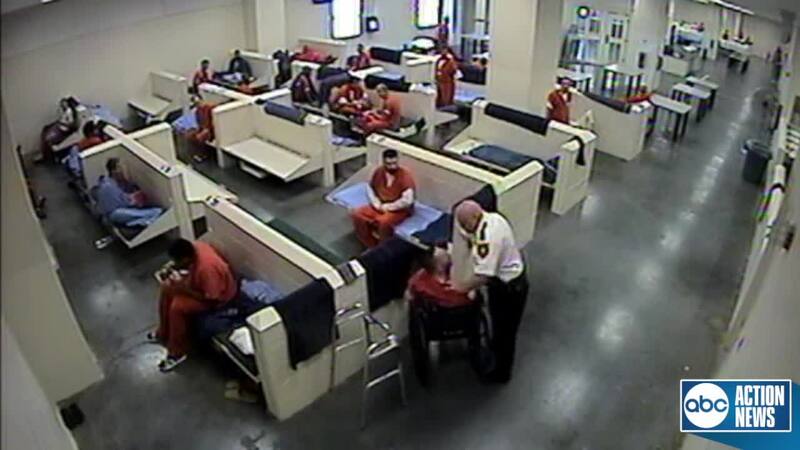 PINELLAS COUNTY, Fla. — A detention deputy at the Pinellas County Jail was fired Thursday for using excessive force on an inmate in a wheelchair, according to a press release. "There's no excuse for it, no reason for it. It's not justified. It's flat out wrong," said Sheriff Bob Gualtieri. Deputy Aaron Hull can be seen in surveillance video from September 2018 grabbing the inmate by the neck and striking him in the face. The Administrative Investigation Division said Hull was verbally counseling a group of inmates during a lock down when the incident happened. Investigators say the inmate, 24-year-old Taylor Schuessler, verbally challenged Hull and other inmates. Hull approached Schuessler after he refused commands to stop, and grabbed his neck while exchanging words with him. Hull then poked Schuessler in the head multiple times while maintaining the grasp on his neck, according to the release. Then the deputy grabbed Schuessler's shirt and got close to his face while exchanging words. The release says Schuessler then spit toward Hull's face. Hull reacted by hitting Schuessler three times in the face with an open hand. Hull then called for assistance to remove Schuessler, according to the release. "It's black and white. Absolutely, no reason. No justification. It's not permitted. He put his hands on an inmate, poked him in the face, slapped him in the head, got into a fight with a guy that can't walk in a wheelchair," said Sheriff Gualtieri. While relocating him, Hull told investigators Schuessler tried to hit him using his head, elbows and a closed fist. While transporting Schuessler the release says Hull grabbed him around his torso until he deescalated his resistance. Investigators say during an administrative investigation, Hull admitted that poking Schuessler's head was inappropriate contact and he should have stopped. According to the release, Hull was disciplined for similar behavior in 2015 when he flipped over a table while trying to resolve an issue with an inmate. The Administrative Review Board determined on Thursday that Hull violated policy and he was fired. "We need to be fair. We need to be consistent. We're going to hold people accountable. If you deserve a break, I'll give you a break, but when you do stuff like this you're done," said Sheriff Gualtieri. Neither Hull nor the inmate were injured in the altercation.